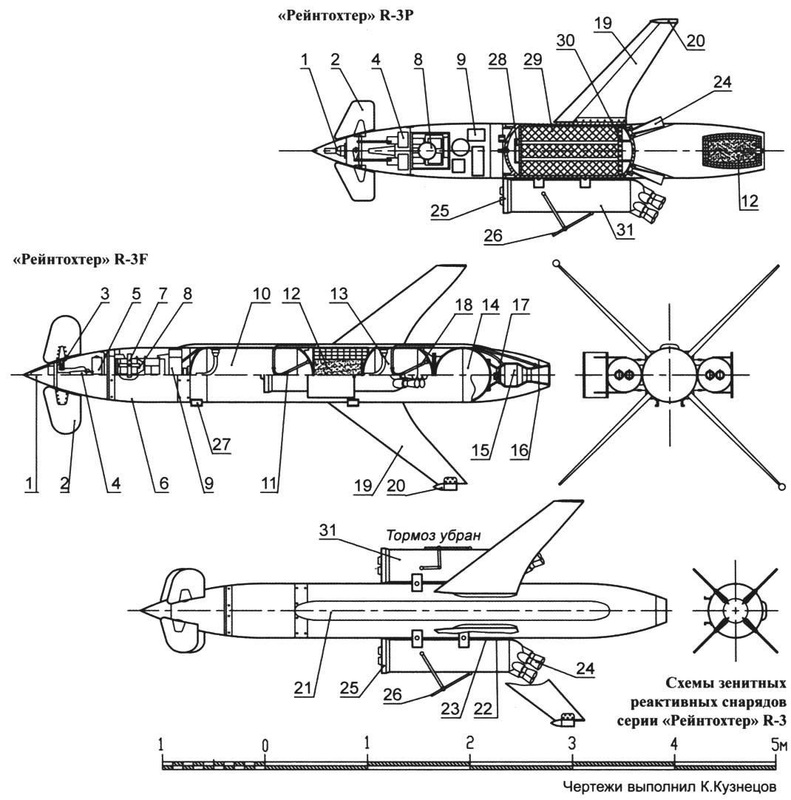 Anti-aircraft guided missiles (AAGM) is located at the junction of rocket technology, electronics, precision mechanics and chemistry, and are the most complex class of missile weapons. Because of this, none of them in the years of the Second world war were brought to combat use, though the development and testing of such systems was carried out in England, USA, Germany and Japan. The most urgent need in the missile weapons of class “air – land” had Germany is subjected to massive air raids of the allies. So here working on anti-aircraft missiles was carried on most intensively, and to the testing stage was brought much more samples than all other countries combined. However, none of these designs before the end of the war were not sufficiently worked out and in the fighting was not used. However, the German work were not in vain. Their results formed the basis for postwar samples generated in the Victor countries. To study German anti-aircraft missiles in the Soviet occupation zone of Germany in 1945, a special Institute of “Berlin”. It’s no secret that the missiles “Wasserfall”, “Schmetterling” and “Typhoon” was tested at the Kapustin Yar, and the basic principles of the guidance system of the first Soviet air defense system “Berkut” (C25) was developed with the participation of German experts. Best was developed the “Wasserfall” (see “M-K” 4/15). Some of the developments made in the project Wasserfall, was used in SAM “Rheintochter” in 1942 the Project “Ranth-Ter” (Rheintochter – Daughter of the Rhine. The rhinemaidens – the three nymphs of the Opera cycle “der Ring des Nibelungen” by Richard Wagner), the degree of testing, of course, took the second place. 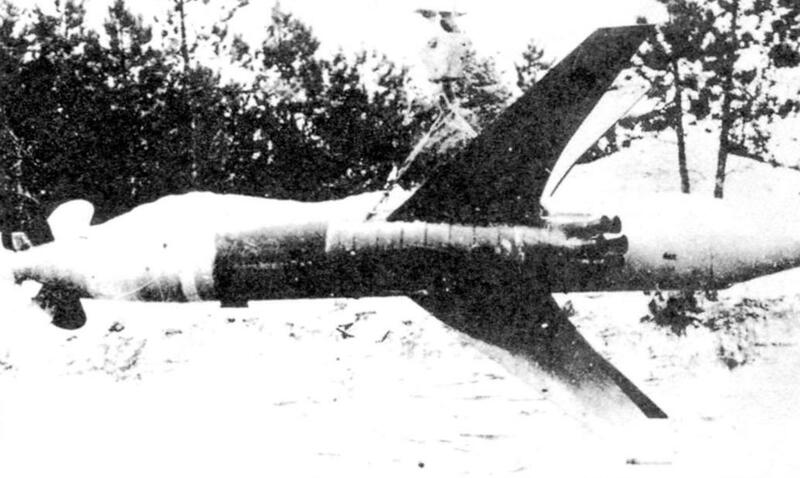 “Rheintochter” R-1 was a two-step missiles with a length of 5400… 5740 mm (depending on the design of the stabilizer), maximum diameter – 535 mm and wingspan – 2450…2,650 mm, depending on their design. The range of stabilizers – 2080…3050 mm Launch weight of the projectile 1748 kg, of which the second stage is 1000 kg. the First stage represented the starting solid rocket booster similar to those used on the rocket “Rheinbote”. Structurally it consists of a welded casing of sheet steel with a thickness of 12 mm, a closed spherical bottoms. Inside the combustion chamber was located 19 draughts of digitalimage powder with a total weight of 240 – 245 kg. In the bottom cover installed seven nozzles and the Central nozzle was removable (in the scope of the rocket included several nozzles with different critical sections, which corresponded to various outdoor air temperatures). While working the SRB 1st stage was around 0.6 C, while the pressure in the combustion chamber was 15.2 MPa (155 ATM.) a pull – 372 kN (38 000 kg). At the moment of separation of the accelerator the speed SAM was 300 m/s. Steel casing 1st stage was bonded by 18 bolts with a special ring made of magnesium alloy, which, in turn, was connected with the 2nd stage by four explosive bolts. The combustion chamber of the 1st stage covered the bandage of the two Polukarov that are held together with bolts. This brace was welded to the angles, between which were inserted and fastened with screws to the feathers of the stabilizer. Starter bracket was also welded to one of poluchaut. Details brace welded from fine iron lost weight, but save light alloys. With this design, it was possible to move the brace along the combustion chamber and easily change a variety of shapes feathers of the stabilizer. All stabilizers were four, and on three sides are supported by ordinary steel area. The fourth side remained open – it was passed directing the launcher (PU). To reduce the size of the stabilizer, sometimes the feathers are attached two rectangular panels worked the stabilizer is a U-shaped type. Sometimes they added another bar – was the stabilizer a U-shaped type. This diversity of structures suggests that the design was not completed, and a final decision on it was taken. Interesting fact – the wings and feathers of the stabilizers were made of laminated wood. 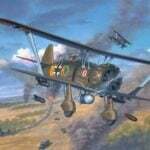 It turns out that at that time in Germany there was a shortage of aircraft plywood and foam! So I took the glued option of using a cheaper (than plywood) glue. The engine of the 2nd stage was in the middle of the flight of steps and was a steel case with a diameter of 510 mm. Case closed convex bottoms with a thickness of 13.7 mm. Side wall in the area of the fuel charge had a thickness of 3,175 mm. In the bottom of the combustion chamber screwed six nozzles installed at an angle, so that the flame didn’t damage the tail section of the rocket. In the combustion chamber was located 220 kg digitalimage gunpowder that burned about 2.5-3 and created a thrust of 4100 kgf. To the combustion chamber 24 bolt-fastened rear compartment with cover, partly covering the engine. Material tail – casting of aluminum alloy. At the rear of the tail section on the steel brackets were placed warhead weighing 150 kg, containing 22.6 kg of EXPLOSIVES and 3000 finished pieces. Placing the warhead in the tail of the missile allowed it to put the engine center of gravity that does not violate the alignment as the burnout of the fuel. The undermining of warhead was carried out of the acoustic proximity Fuze “Kranich”, located in the nose of the rocket. Fuse “Kranich” still had to work. In the casing tail section cut the grooves for outputting the nozzle of the engine. In the design process were created a model of Zur, in the scale of 1:2.5, which were used for throwing test (without control system). In addition, purging was carried out in wind tunnels. Studies have shown that it is possible to abandon missile control roll. The control system was allowed to react with rudder, depending on the position of the missile roll, with its slow rotation around its longitudinal axis. But to obtain a sufficient shear force when the management decided to install as many as six wings, and quite a large scope! Aerodynamic studies have shown that to overcome the sound barrier, you need a wing with greater sweep and a thin profile. The wing structure was similar to the design of the stabilizer – laminated wood. In one embodiment, tail and middle part of the wing is sheathed by dural sheets for protection from the torches of the engine. Wing shape in the plan differed in different samples of the rocket. To facilitate visual tracking the missile on the wingtips of the two wings established tracers and the rear edge of the other two wings pasted antenna radio system. The wings were attached similar to the stabilizer – to the corners of the brace covering the engine and rear compartment. The front compartment of the rocket was made out of aluminum and was secured by 18 bolts to the engine. It was located in the control equipment: gyro, radio, and power supplies of the transceiver. Over instrument compartment is attached to servos, and in the bow – proximity Fuze “Kranich”. At the front of the compartment were four helm (also from laminated wood), uklonivshiesya at an angle of 10°, provide yaw control and pitch. 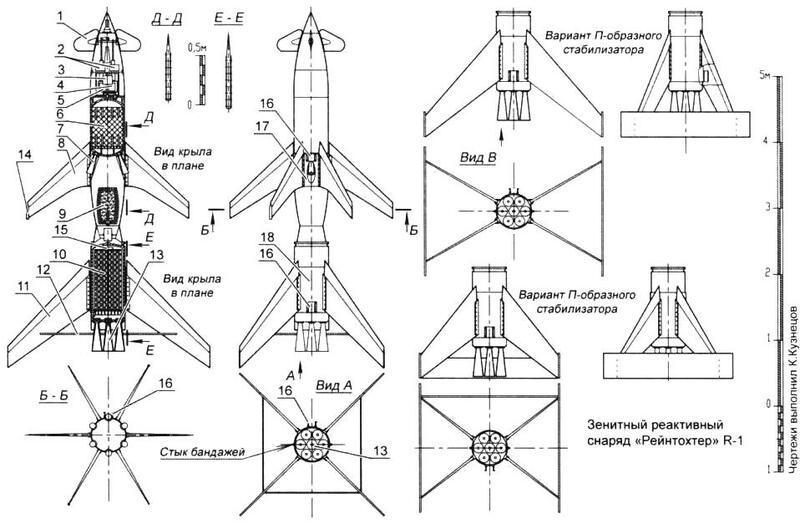 Overall layout of the rocket turned out to be quite cumbersome, but the location of the warhead in the tail, and engine – in the middle of the fuselage provide a slight change in alignment of the rocket’s fuel burn. 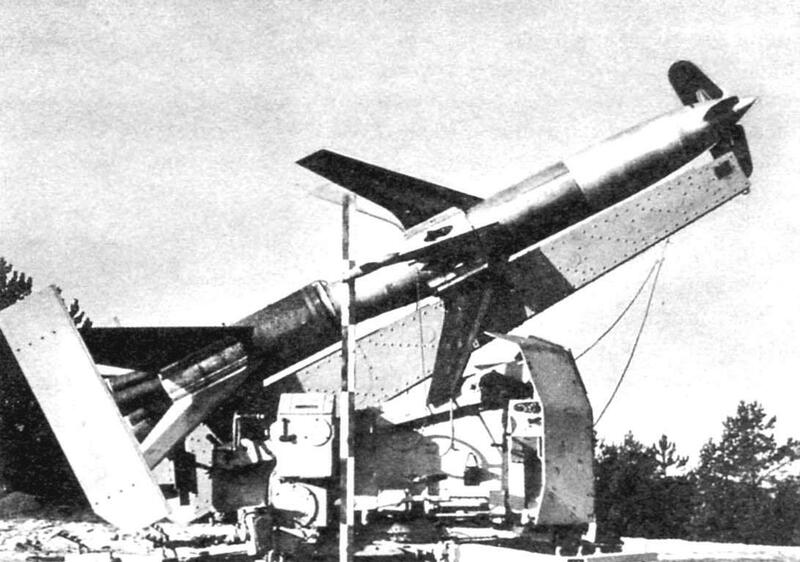 These large missiles were induced through a system of “Rhineland” (see MK 4/15): It consisted of two radars (one for target and one for SAM), a control unit with scenereleases device, Siemens and joystick. Counting-critical device processed signals coming from both the radar and the operator carried out the tip. In addition, provided the defendant, which sent signals on the radar, facilitating the tracking of the projectile. Was also provided by the team at undermining the warhead in case of a miss. In the case of enemy jamming, the tracking of the projectile was carried out visually using an optical pipe. The adoption of the guidance system could hold the missiles on the line of sight of operator – goal, but it was significant drawbacks, since in the terminal phase of flight missiles required g-force was very large, and the pointing accuracy is low. Accordingly, the Germans began to develop the homing system. Flight tests of rocket R-1 was begun in August 1943 near Libau on the Baltic. Until June 1944 made 34 start-up. Due to the low characteristics of solid rocket motors of the time (fuel burned during the first seconds of flight) the rocket quickly accelerates, and then flew out of inertia, rapidly losing speed. The rocket rose to a height of 6 km and had a slant range of 10 -12 km, at a speed at the end of the active site of up to 400 m/s As the height of the missiles was below the set, then the decision was made on the development of other missiles, with a ceiling of not less than 10 – 12 km. However, testing and debugging R-1 continued. January 5, 1945, was carried out 82 missile launch. The decision of the Commission V. Dornberger further fine-tuning of the rocket stopped, and she was immediately transferred to the test in Peenemunde. To do this, to February 20, 1945, was delivered to 20 missiles. After the war of the missiles “Rheintochter” could get in the USSR, although in the literature there is no mention. 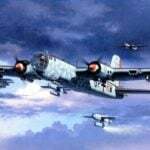 Marshal Goering had ordered to complete the project “Rheintochter” R-1 of R-W, is able to intercept the Anglo-American planes at an altitude of 10 km, and By January 1945 was made six launches unmanaged variants of this anti-aircraft missiles. Moreover, the designers developed two directions: R-3F, with the 2nd stage liquid fuel and R-3P – completely solid. In the period of design considered the interim version of the R-2 with roll control, but he refused. In the design of missiles the Germans have made great efforts to evaluate their effectiveness and to identify requirements for the control system. Because the kill zone of the warhead and the probability of hitting the target played a decisive role in the assessment of the tactical advantage of missiles on anti-aircraft artillery. Studies have shown that under favorable conditions, and visual monitoring missiles and aim the pointing accuracy was ±20 m at a distance of 10 km When hovering with the help of radar, the error was doubled. On this basis, designed a warhead weighing 150 kg 60 kg had 1,700 fragmentation-incendiary submunitions. Undermining warhead at a distance of 35 m has created a fragmentation field, which destroyed the b-17/b-24 with a probability of 0.3. This type of efficiency considered sufficient. This had clearly worked non-contact radio controlled fuses. His receiving and transmitting antenna was located in the nose of the rocket under the cowl without protruding parts. The air Ministry demanded that all types of missiles, including the R3, could reach a height of 10 – 12 km. of the Work on the project began in may of 1944 To January of the following year there were six launches of unguided weapons. The type of control system and was not elected – a number of sources says that the equipment of the rocket was intended to complement another channel of detonation of the warhead upon command of the operator from the ground. In addition, the coordinator of the rates (depending on the roll angle) can be placed on Board the missile or on the ground, and to transmit the synchronization signal by radio. Since 20 Feb 1945 15 missiles R-3 was planned to send in peenemünde, the issue of missile control in any way required to solve in the shortest possible time. “Rheintochter” R-3 was designed in two versions. The most elaborate was a variant of the R-3F (or RTIIF) with expander on the 2nd level. In the early 1940s the energy characteristics of liquid fuel superior characteristics of solid propellant. And therefore, LRE was easier to achieve the required characteristics in terms of range, and especially – the height. As the main engine of the 2nd stage, we used the engine design Dr. Conrad. This engine used components: nitric acid (335 kg) and fuel – “Thin 250” (88 kg) or nitric acid (335 kg) and “Vital” (88 kg). Supply of components was displacing, by means of compressed air. The combustion chamber is cooled by the oxidizer. The engine had two modes of traction: for the first 5-15 seconds was pull 21,4 kN (2170 kgs), and in the subsequent 25 – 48 sec – 17,5 kN (1800 kg). Starting weight 2nd stage -700 – 730 kg. have also Changed the layout of the rocket. The power plant was carried out by one unit. In the rear was located the combustion chamber with the nozzle. Followed by a conical spacer, which housed the valves and reducer pneumatic bursting membrane fuel lines, etc. Then there was this ball container is made of two stamped steel hemispheres. Before it was attached to a tank of fuel (88 kg). Then was fulfilled the gap in which is mounted the warhead described above. The front of the warhead housed a tank of oxidizer, containing 335 kg of nitric acid (Selby). Fuel and pneumatic pipelines, and cables passed along the outer surface of the housing and closed by a streamlined fairing. Oxidizer tank, its piping and all fittings inside had a thin coating of pure aluminum. The Germans hoped that this will prevent corrosion and ensure a shelf life of filled rockets in six months. As in the rocket “Wasserfall”, in the R-3F was applied movable inlets for fuel and oxidizer. They also were made of aluminum, and only movable joint – the bellows is made of a specially developed stainless steel. The housing is attached to four wings (two with tracers and two with antennas). The number of wings had to be cut because the sides had to install boosters. The accelerator consisted of a steel case with a diameter of 320 mm and 7-mm walls. At the ends closed with removable lids – flat – front, and spherical the back. Start-up accelerator with a weight of 390 kg contained 170 kg digitalimage gunpowder. 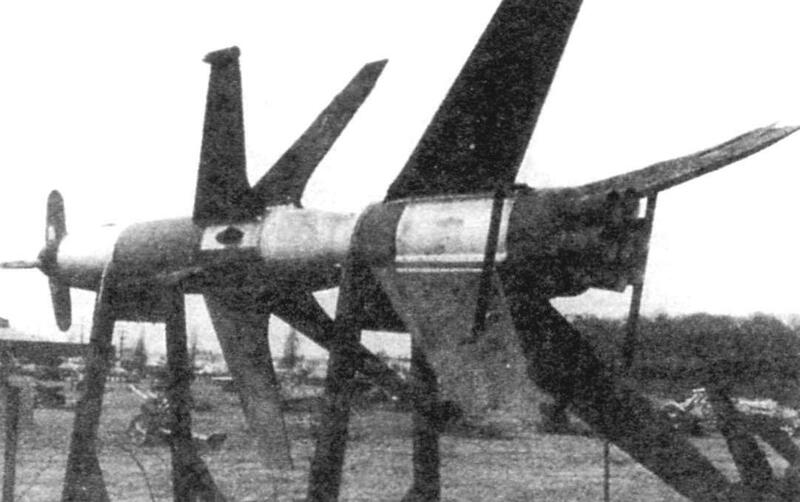 For 0.9 he developed a thrust of about 143 kN (1450 kgs). Each accelerator had seven nozzles inclined to the longitudinal axis, the thrust vector which passes through the center of gravity of the rocket. This simplifies the balancing of missiles with different propulsion accelerators. Reliable and simultaneous separation of the boosters was carried out by explosive bolts and aerodynamic brakes in the form of plates made of aluminum. The head of the rocket borrowed from R-1 and was significantly modernized. It was a battery, three phase inverter, feeding all equipment, radio system, proximity Fuze canoe, gyroscope, and electric servos. The rudders were deflected at angles ±10° at 30°. The starting weight of the rocket 1830 kg, 2-tier – 1050 kg At the end of the active portion of the missiles accelerated to 450 – 470 m/s, rose more than 10 000 m and had a slant range of 20…25 km At the beginning of 1945, has been instructed: to 20 Feb 1945 in peenemünde to deliver 15 missiles R-3F. But to work out the missile did not. In parallel with the work on R-3F develop its solid-fuel variant of the R-3F. From this sample, instrument compartment, wings, boosters are the same as R-3F To achieve the specified height of the fire 12 km from the mass of the charge required to increase to 450 kg, and the engine operating time up to 40 s. To achieve these parameters, the sword should have a greater thickness of the arch and the outer diameter of 500 mm. was first Used in the forging technology of obtaining powder of checkers could not solve this problem. Were studied two ways to exit this situation. In the first case was a transition to a non-volatile solvents such as TNT. The sword was made by casting, which removed the limit on its diameter and length. In the second case, I used the sword of six to eight propellant modules. It was a pioneering invention that has subsequently found wide application at creation of large solid propellant motors for a composite fuel. The engine thrust was about 21 kN (2060 kgs) for 40 s. This allowed the 2nd stage mass of 1120 kg to maintain a high subsonic speed of flight. The warhead remained unchanged and were located in the tail section. In this regard, the engine had four nozzles placed outside the contour of the fuselage. The nozzle was held inside the fairing of the wing and was with him in the same plane. This engine was tested on the bench prior to February 6, 1945, when the R-3P was discontinued. For R-1 was designed launcher at the base of the mast from 88-mm anti-aircraft gun, and R-3 intended use installation semi-closed, with a concrete base and with guides in the form of a frame, however to work it did not. Organization use of anti-aircraft missiles in General did not differ from anti-aircraft artillery. 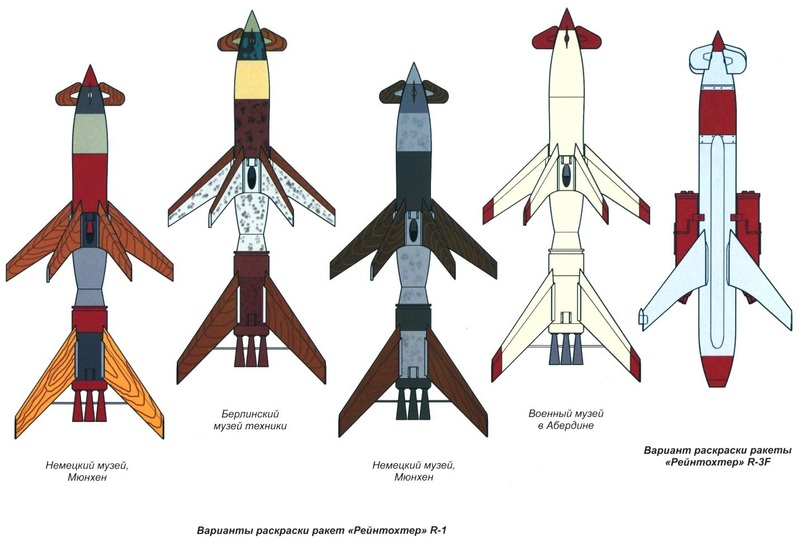 It presupposes the existence of means of detection, command post and 4…6 launchers. The division also included the loader and a warehouse for missiles. In our time, the missiles of type R-1 preserved in some museums in the United States and Germany. Complete missiles R-3 to the present day is not reached, there is only the unit of the power plant.